Well Above Average: Horton Hears a Who! 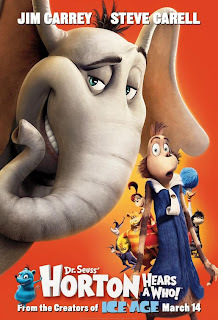 Due to popular demand (by two voters anyway...), I checked out the popular animated feature (over $100 mil domestic gross and counting...) Horton Hears a Who! this morning. 21 and Run Fatboy Run got lackluster reviews and I wasn't sure I was up for the war movie Stop-Loss, so this light-hearted kid's story fit the bill. Prior to the movie, I had to sit through trailers of upcoming kiddie flicks. It's easy to see why Horton is doing such good box office given the dearth of quality material for the younger set. Speed Racer looks loud--a bombardment of garish images and sounds, Kit Kittredge: An American Girl featuring Little Miss Sunshine's Abigail Breslin looks insipid and she can't save Nim's Island either (Breslin's mini-ingenue career rivals Amy Adams--she's got top billing over former child star Jodie Foster and 300's Gerard Butler in Nim's Island..). The animated Wall-E looks fantastic ,although the title character bears a striking resemblance to the robot in Short Circuit and there's another Ice Age movie upon us--this one features dinosaurs (Admittedly, I'm not so great with science, history or geography but I thought dinosaurs PRECEDED the Ice Age. Maybe Ice Age 3 is a prequel...). The animation for Horton is breathtakingly beautiful. In addition to details such as water ripples, shadows and light and fur that looks soft enough to stroke (there are at least nine people credited as "Fur Technical Director" on the film! ), the colors and shapes of Dr. Seuss' beloved characters and settings are perfectly captured. Ken Dauro and Cinco Paul, who adapted the Seuss classic story for the screen, have managed to stay faithful to the tone and timbre of the tale of an elephant who discovers a tiny little world in a speck on a clover. Vocal talent is provided by some of today's top comic actors: Seth Rogen, Jonah Hill, Amy Poehler, Jaime Pressly, Will Arnett, Isla Fisher, and the great Carol Burnett as an uptight and domineering kangaroo. The two leads, Horton and the Mayor of Who-ville, are voiced by Jim Carrey and Steve Carell respectively, but the often scenery-chewing famous funnymen are notably restrained in their roles here. If I hadn't known in advance that Carrey and Carell were the voices behind Horton and the Mayor, much of the time I wouldn't have been able to tell. They are pitch perfect in their delivery of the earnest and faithful elephant and the well-meaning Mayor and set aside their usual shtick. The funniest line in the movie, however, was the Mayor's response to his assistant when she reminds him that he has a "Who-root canal" appointment: "Sticking "Who" in front of everything doesn't make it hurt any less!" I'm pretty sure that was a Steve Carell ad-lib and it was priceless! Carrey gets his shot in with a nod to Apocalypse Now as Horton is being pelted with fruit saying, "I love the smell of bananas in the morning!" Horton Hears a Who! manages to combine dramatic tension, guileless charm, humor and tenderness in a mere 88 minutes. Although I can't say it beats out How the Grinch Stole Christmas (the animated Holiday staple featuring Boris Karloff, not the crap-tastic Jim Carrey live action version...) as best Seuss adaptation, it definitely ranks right up there.